YouTube went down for an hour last week. 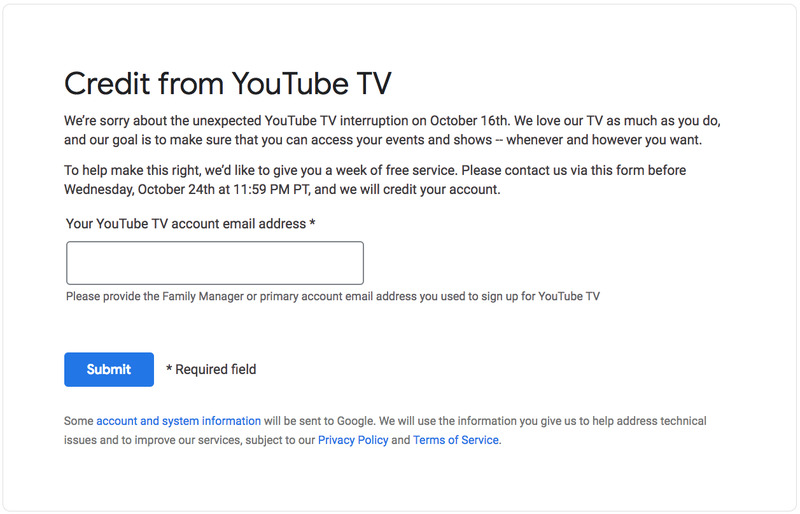 People who pay a monthly subscription for YouTube TV are being offered a free week of service or a $US10 credit, depending on how they pay for the service. If you were affected, you have until the end of Wednesday to apply for the credit. Last week, YouTube went down for over an hour. It was a rare outage for the Google-owned video service, and it left YouTubers and viewers alike wondering what to do without their favourite free content. But some people pay for YouTube. Subscribers to YouTube TV pay $US40 a month for a batch of live channels and TV programs – and that service wasn’t working either when YouTube went down. Now, YouTube is hoping to make up for it with $US10 credits – but you have only until the end of Wednesday to tell the company you want to redeem them. 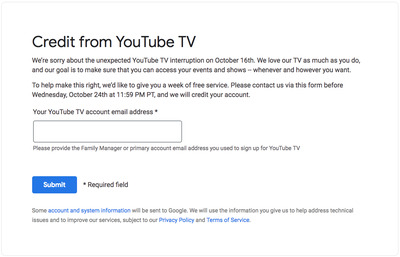 “We’re sorry about the unexpected YouTube TV interruption on October 16th. We love our TV as much as you do, and our goal is to make sure that you can access your events and shows – whenever and however you want,” YouTube said on its help page. “To help make this right, we’d like to give you a week of free service. Please contact us via this form before Wednesday, October 24th at 11:59 PM PT, and we will credit your account,” it continued. Anyone who’s been affected should receive an email from YouTube. 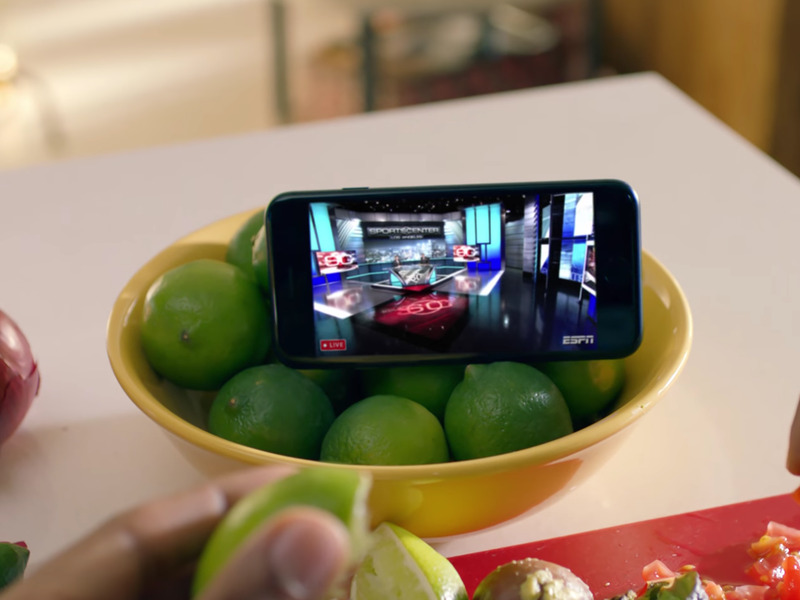 If you subscribe to YouTube TV through Apple’s App Store, you should see a $US10 App Store credit “appear in your App Store account in the coming weeks,” according to a tweet from Fast Company’s Harry McCracken. A good response to the YouTube TV outage the other day. I wonder how complex it is for YouTube to engineer a credit to every YouTube TV subscriber via the App Store?